Do you usually buy more W-2s than you need? Have you ever had your printer jam and eat a bunch of them? Have you turned away last-minute billings because you didn't have the forms you needed? How about replacing the forms for that one employee whose dog ate them? If you have a laser, inkjet, all-in-one or printer/copier that supports windows graphics; and our Payroll, Industrial Strength Payroll, or CCIS Pay from CCIS Software, these computer generated forms will set your mind at ease. Use them whenever to print as many SSA- and IRS-approved W-2 and W-3 forms as you require with no fear of ever running out. 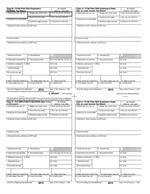 Employee W-2 Forms in Condensed Format.